Looking for a refreshing way to cool off this Friday? Enjoy a FREE Tall (12 oz.) handcrafted Starbucks Refreshers™ beverage at participating stores, this Friday only - Friday the 13th. Choose from Cool Lime (made w/ real lime) or Very Berry Hibiscus (made w/ whole blackberries). No purchase necessary. Limit 1 per person. Get our new Starbucks Refreshers™ beverages in one of three energizing ways: handcrafted with real fruit, sparkling ready-to-drink with real fruit juice, or Starbucks VIA Refreshers™ instant beverages. 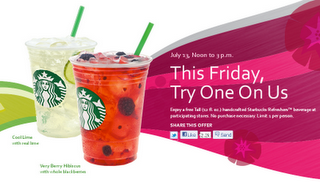 I'm going to be sure to head into my local Starbucks and take advantage of this free drink offer. I've already decided to choose the Very Berry Hibiscus... YUM!